Wanted: Nickname for high-scoring Lakevile South trio. Send your suggestions to Lakeville South High School, attention head boys hockey coach Kurt Weber. Okay, so maybe the Cougars aren’t ready to go that far. But they definitely are open to suggestions for a moniker for their top line. 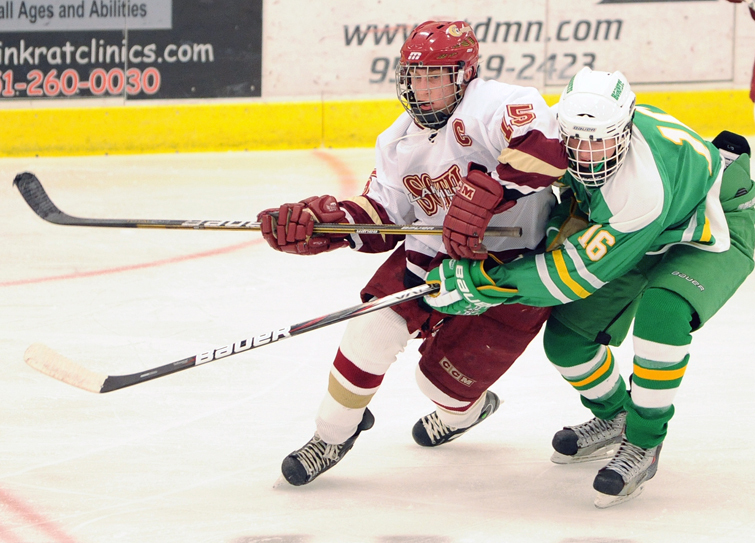 Senior playmaker and Mr. Hockey candidate Justin Kloos just hopes it will be better than the nickname he and his linemate Alex Harvey had when they were sophomores. “My sophomore year, when Kyle Osterberg was playing with us, they called us the Penguin line,” Kloos said with a laugh. “I think it was because Alex and I were kind of smaller guys and were always chirping on the ice. Kloos and Harvey, also a senior, are paired with a talented sophomore in Patrick Lauderdale. Raved about for his hockey smarts, Lauderdale figures to give the Cougars one of the most dangerous lines in the state. Last year, Kloos and Harvey combined for 64 goals and added 74 assists against a difficult schedule that included a slew of top-20 ranked teams. With Lauderdale now on right wing, opposing teams will certainly have plenty of nicknames for the trio in no time, of course most of those names might be R-rated. While Weber is keeping his thoughts to himself, that doesn’t mean some suggestions haven’t already been thrown out there. The name was mentioned to Harvey, who was skeptical until it was pointed out it was originally the name of a soul and R & B band in the early 1970’s (he had never heard of them). “I think I would probably be earth because I’m the center of the line and kind of hold everything together,” Kloos said. “ I think Alex would definitely be fire because he can score from anywhere; he’s so dangerous with the puck. “Pat would be wind because he’s quick thinking and really smart on the ice. He kind of reminds me of us when we were sophomores. He still hasn’t filled out yet physically but he definitely has the ability to think the game. At least it doesn’t involve a penguin right? Okay, so it’s a work in progress. Truth be told, Kloos and Harvey haven’t put much thought into it. They know, nickname or no nickname, their line will be critical when it comes to the Cougars’ success in 2011-12. They’re used to the pressure. The dynamic duo have played side by side since Pee Wee’s. Through the years, while their game has grown, so has their relationship. Both have no problem attributing their success to the other. As Harvey points out, their closeness off the ice has led to their success on skates. Teammates, yes. Great friends, absolutely. 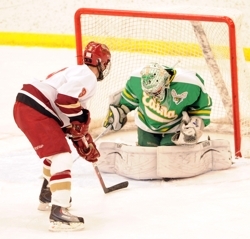 Even next year, while Kloos will be taking his talents to the next level (he committed to the University of Minnesota as a junior), their conversations center around taking that next step together. Harvey remains undecided about his hockey career after high school. Kloos is equally as appreciative when describing what Harvey brings to the rink. Cougar fans have started to see flashes of brilliance. Although still developing its chemistry just three games into the season, South’s first line has accounted for five of the team’s 10 goals and has seven assists. Still, Kloos and company shy away from talking about individual numbers; wins and losses dominate the discussion instead (South is 1-2-0, with both losses to top-10 ranked opponents). Whatever happens, it’s going to be done together.